Audi Q8 Performance, Engine, Ride, Handling | What Car? The Q8 is available with just one engine at launch: a 3.0-litre V6 diesel badged 50 TDI. Lower-powered and higher-powered versions of that same engine, badged 45 TDI and 55 TDI respectively, will be added next year, while more performance-focused variants are expected to follow later still. Fortunately, the 50 TDI is a good engine, pulling strongly from low revs and always feeling like it has plenty of power in reserve. 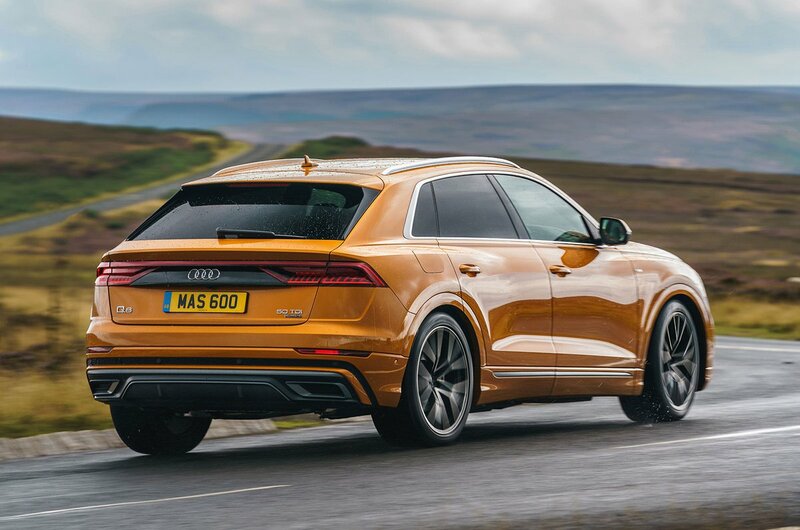 Put your foot down hard and the Q8 will dispatch the benchmark 0-62mph sprint quicker than V6 diesel rivals. For some reason, though, compared with other Audi cars that use this engine, it sounds a little more gruff in the Q8 than we're used to. That said, once you’re up to speed it’s barely audible and there’s very little vibration through the controls. In fact, there's little to disturb your peace at all, aside from a bit of wind noise whipped up around the door mirrors on the motorway. Our only significant complaint concerns the eight-speed automatic gearbox that the engine is paired with; it can be painfully slow to kick down and, if you go to overtake, for example, it hesitates for a second or so before finally delivering the power in a rather erratic fashion. It's genuinely frustrating and, sadly, even selecting Sport mode does little to improve things. Manual mode is more obedient, thankfully. The Q8 is actually a mild hybrid, meaning its engine can turn off for a limited amount of time at a cruise to boost efficiency – a system that works so well that you don’t even notice it happening. As a bonus, it makes the engine stop-start system noticeably smoother than those in rival cars. 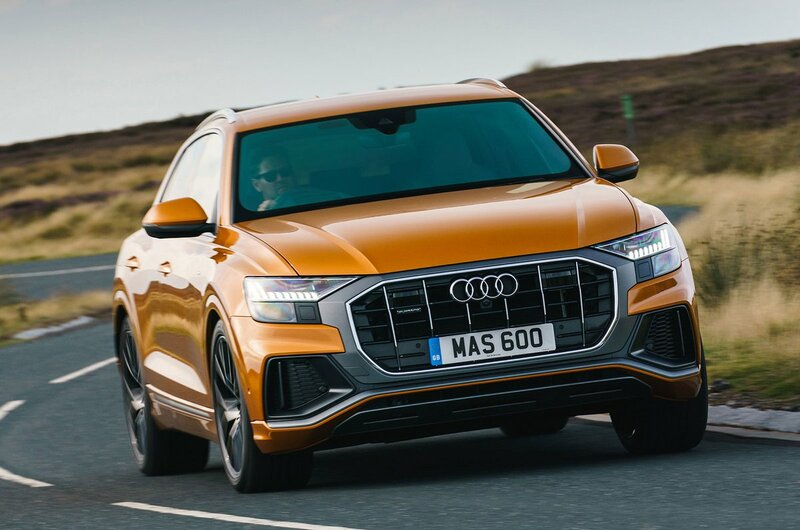 Handling is impressive, with the Q8 suffering from minimal body lean through corners, while quattro four-wheel drive ensures there's no shortage of traction, and the sharp steering has a reassuring heftiness to it. Overall, the Q8 is on a par with the BMW X6 in this area. It doesn’t feel that much fun, though. Indeed, like most Audi cars, it’s merely effective. 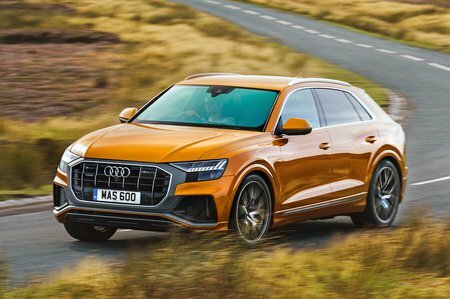 There’s precious little information filtering up from the front tyres to the steering wheel, and while the optional air suspension does limit body roll in Dynamic mode, it can’t hide the Q8’s two-tonne bulk through quick direction changes. What the car does do well is grip the road firmly and in a totally predictable manner. Adaptive suspension is standard, but the smallest wheels available are 21in and, whatever driving mode you select, there's a firm edge to the low-speed ride. That said, even on the largest 22in wheels (they are standard on Vorsprung trim), the Q8 is never uncomfortable; sharp-edged potholes and expansion joints do send more jolts through the interior than you’d get in a Q7, but the suspension doesn’t crash or bang and it ultimately feels more pliant over scraggy roads than the X6. Four-wheel steering is available as an option (or standard on Vorsprung trim). However, while it makes the car feel a bit sharper on turn in and a bit more stable at motorway speeds, the biggest benefit is a reduced turning circle.